GENOA, Italy—Heavy machinery began winching down a huge slab of concrete in the northern Italian city of Genoa on Feb. 8 to clear the way for a new bridge to be built after the old one collapsed six months ago, killing 43 people. A 218-yard-long section of the bridge gave way in August of last year, sending dozens of vehicles into free-fall and severing part of a motorway linking Italy with southern France. The Morandi bridge, opened in 1967, was also a vital link within the seaside city, and the activity of the busy port has been put at risk without it. “This marks the relaunch of Genoa, Liguria, and Italy,” said Prime Minister Giuseppe Conte, who spoke before demolition began. Famed Genoa-born architect Renzo Piano, who designed the Centre Georges Pompidou in Paris and The Shard in London, donated a proposal for the new viaduct and has agreed to supervise the work. 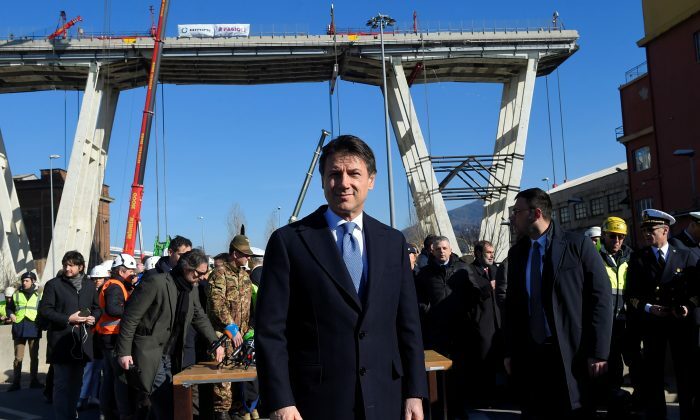 After the bridge collapse, the Italian government blamed operator Autostrade per l’Italia, which is controlled by the Benetton family, for poor maintenance and threatened to revoke the group’s concessions. The transport ministry has also said it had no responsibility.